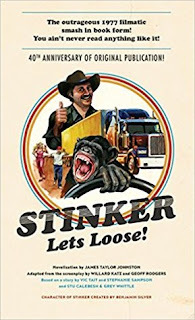 Because I Told You So: Book Report: "Stinker Lets Loose"
This is an incredibly funny book. 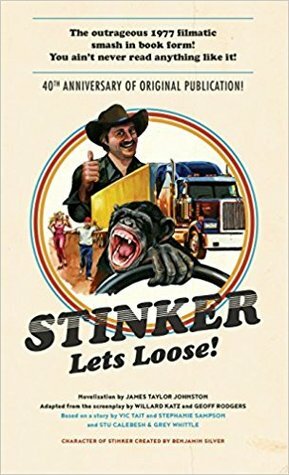 A mock 1970s trucker B-movie novelization, it's full of commentary on topics such as masculinity and politics. It's both a satire and a straight-up action book, if such a thing existed. Johnston -- which I am guessing is a pen name -- or whoever write this did so in an easygoing, whiskey-sipping, campfire storytelling manner. He makes writing look easy, and his storytelling manner and voice are true inspirations. This is a beautiful book, gleefully repulsive in every conceivable way. The Audible version is blessed with a full voice cast, and plays more like a radio play than a typical audiobook. Jon Hamm goes against type as the breezy, freewheeling trucker, and narrator/director Eric Martin carries the narrative with down-home glee. The country songs add to the atmosphere, as did the bed music. The only problems I had with the audio gimmicks was the gratuitous and overused sample of Stinker's laughter, which sounded nothing like Hamm's voice acting.